The experiment in Democracy seems to be failing badly in Arizona. Here, government, the state legislature, law enforcement, the educational system, the courts and the media are a testament to this colossal failure. Here, rampant hate and bigotry starts at the top and here, it is government by [ugly] mob rule. A court proceeding earlier this month in Phoenix – with a decision expected any day now – attests to this experiment gone awry; the court hearing was as absurd as the daily Kangaroo trials in Tucson known as Operation Streamline (70 migrants are charged, tried, convicted and sentenced in one hour). 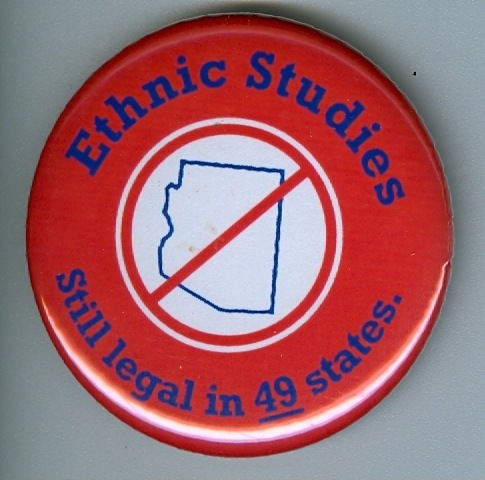 This Phoenix proceeding was part of an appeals process, being held to determine whether Tucson’s Mexican American Studies (MAS) Department is out of compliance with HB 2281, the state’s anti Ethnic Studies or mind control measure. The program graduates nearly 100% of its students and sends over 70% percent of them to college. Yet, these phenomenal accomplishments are of little consequence for those trying to eliminate it. This last hearing featured a formidable sounding state witness, Dr. Sandra Stotsky. She testified that multiculturalism is harmful to students. Upon review of MAS curriculum materials, she testified that she saw no evidence that MAS students are being reminded of the virtues of being American citizens (her specialty is teaching the virtues of democracy to students in the former communist countries of Eastern Europe). Her very presence, given her expertise, gave off a disturbing message. She made the further assessment that MAS students were being taught to resent whites [HB 2281 bans classes that teach resentment, create ethnic solidarity and that promote segregation). Her testimony sounded very damaging to the MAS cause… until she was cross-examined. She readily acknowledged that she was not an expert in Ethnic Studies, Mexican American Studies or Critical Race Theory. She further revealed that she had never set foot in an MAS classroom nor had she ever spoken with an MAS teacher or student, nor read MAS books, though she claimed to be familiar with some of them. Upon making these acknowledgements, the erudite-sounding scholar and the state’s star witness was thanked and asked to step down. At the previous hearing, the director of MAS-TUSD, Sean Arce, was forced to defend the MAS curriculum in a manner comparable to the 1950s McCarthy hearings. [Indigenous] knowledge itself was on trial. The proceedings were actually closer to an Inquisition; they were about what can be taught inside of Arizona’s K-12 classrooms. Books, authors and even classroom posters (“Who’s the Illegal Alien, Pilgrim”) were on trial. Glaringly absent was any mention of the independent Cambium Study, which was commissioned by State Superintendent of Public Instruction, John Huppenthal. It found MAS-TUSD to be in compliance with HB 2281. Despite this, Huppenthal rejected the findings and declared MAS to be out of compliance. This is what triggered the appeals hearings. Inexplicably, neither the Cambium authors, nor Huppenthal, were called to the stand. TUSD superintendent, John Pedicone, however was. He testified that there were things that bothered him about the curriculum, but admitted that he saw nothing illegal. Eerily, no one was there to ask him why he ordered the May 3rd school board meeting militarized, at which time the neighborhood and TUSD headquarters were occupied by riot officers, students and elders were arrested inside the meeting (some were physically thrown out of the building) and youths outside were beaten. 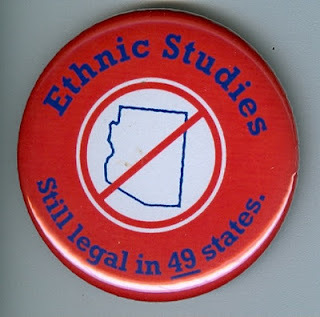 The hearings revealed that beyond Tucson’s MAS program, it is the discipline, and by extension, a people and their right to history, culture and memory that have [again] been put on trial. Also revealed is that MAS stands accused of being outside of civilization and specifically, outside of Western Civilization, in effect, that its knowledge-base does not concur with the U.S. Master Narrative of history. Actually, that is not in dispute; MAS’s philosophical foundation is in fact derived from the ancient maiz-based cultures of Abya Yalla or Cemanahuac [Americas], as opposed to Greco-Roman culture. This begs the question: since when is having a different cultural, historical and intellectual tradition, grounds for an intellectual execution? While the decision is expected in mid-November, it is actually Huppenthal, who campaigned to “Stop La Raza,” that will render the final verdict. If he rules against TUSD, look for MAS to be openly taught in front of the capitol and other state buildings. The suggestion that the MAS curriculum be remanded to the home is an idea that is so 500 years ago.